There is no shortage of different ideas and ways to make money online. However, you may not get a second chance to make a good impression as there are way too many experienced online entrepreneurs who are too selling interesting products to internet users. Hence, why not start by selling top trending products that you may stand a better chance to sell from home? Read this step by step guide to learn how you can make money online selling top trending products even if you are totally new to the online marketing domain. Before outlining the methods to sell online, first, we ask ourselves what are the most popular products to sell on the internet these days? Definitely, we don’t want to sell stuff that nobody wants. You need a good supply of hungry buyers if you want to make regular sales. If nobody wants what you’re selling, at the price you’re selling it… well, that’s when you get stuck with a garage full of stuff you can’t sell. I’ve compiled a list of the 10 hot and trending niches that are profitable hottest items to help you get going. You can also try to explore the other niches that fit your passions with Google Trends. It is a great tool to trace and identify trending products that are popular in the recent years. The tool gives you a general trend based on overall search volume for a specific duration such as a week, a year and all the way back to 2004. Other than that, you can also compare the search volume of multiple products simultaneously. Furthermore, you could check the cities and countries where your niche ideas are most in demand too. Now, as a field, selling products (digital or physical) is entirely legitimate. This method of making money works for many people and it can be powerful. Yet, for beginners, the field is also very tough. In most cases, you would find yourself struggling to turn a profit. To make matters worse, you may find that you end up losing money by investing in the wrong products or making bad decisions. What About Selling Products on eBay or Amazon? Ebay is one of the most popular online venues for merchandise. Check out these moms who’ve made a business out of selling things on Ebay. You can start by selling things from your own home that you don’t need or want anymore. However, this post is about selling popular products online. Successful eBay and Amazon sellers make money by buying from wholesale suppliers at wholesale prices and then selling online at retail prices. Deciding what to sell is a huge decision… and if you get it wrong, you can end up losing money, rather than making money. As I mentioned above, don’t sell what you just think will work. If there is no demand, you are not going to make a dime from it. Often the things we think will do well actually aren’t that great. Especially if everyone else has the same idea. You need to make your business decisions based on facts, not hunches. I am not a big fan of eBay or Amazon because there are several drawbacks. One of them is that setting up shop on a marketplace can potentially supercharge your sales. Not only that, it also exposes you to another cost center: marketplace fees. Before selling your products on a marketplace, you’ll want to make sure you have a good sense of your margins and a firm understanding of the marketplace’s fee structure. While the marketplace infrastructure has many advantages, it’s important to remember that it can cut both ways. Marketplaces don’t exist to help you, but to help themselves. That means they might restrict the degree to which you can brand your presence, communicate with customers, dictate what items you can and cannot sell, and so on. Well, the method I promote is something called affiliate marketing. As a field, affiliate marketing is incredibly powerful, even though it continues to be underestimated. For those are new to this term. Affiliate marketing is the process of promoting another companies product or service in exchange for a commission. The basic concept is that you’re promoting products, rather than actually selling them. You do this by providing an affiliate link. If a person clicks on that link and buys something, then you make a commission. This difference in approach is huge. In particular, it means that you don’t have to host different products on your website or create listings for them on a site like Amazon. Likewise, you don’t have to think about shipping, customer service or anything like that. Simply put, it lets you grow a business without having to worry about the actual processes of selling anything. So, you get the benefits of selling stuff, without the complications that normally go with doing so. There are 100,000’s of affiliate programs that you can join, choose products, promote them, then get a cut of every sale. At the core, you have a product and you have a consumer. Connecting these two items is YOU, the affiliate (and your affiliate link). At the core, that is what affiliate marketing is. Obviously, there is a bit more to it than this, as in, how do you find and attract consumers, but the process of making money as an affiliate is not any more complex than this. In most cases, affiliate marketing is done through your own website. The idea is to use a website as a way to reach out to potential customers and promote products to them. One cool thing about this is that you have complete control. So, you get to build your site the way that you see fit. That includes choosing the appearance and what modifications you do, along with the focus of the site and what you specifically write about. 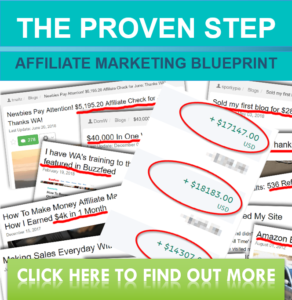 Here is a diagram that shows the step-by-step to start your affiliate business. Your online business should not feel like a day job. Earning money online should be fun, and it is fun. This all starts with choosing a niche that you are interested in and will enjoy working with. The more you enjoy doing something the less it feels like a job and the more productive you are going to be. Your niche could be anything, but at the core of your niche selection it should be something that you “like”. Something you enjoy. Something you can talk about. Something you want to learn about. In the simplest form, a niche is really a group of people looking for stuff. When you select your niche, you want to avoid being too broad with your niche selection. What people fail to understand is the fact that there are millions of people looking for stuff online within what seems to be the smallest of niches, but they really are not. Any niche can become a “full time” successful business. You can use WordPress blog and host it on Bluehost. Alternately, if you would like to try to start a website just want to practice and try out your new skills, you don’t have to buy your own domain for trying out. You could get going quickly with SiteRubix where it comes with a site builder and you can get a free domain name too. To attract visitors, you need good content that is SEO-ed and engaging. Content is going to be the “meat” of your site. Content will be the difference between getting lots of traffic becoming an authoritative site, and you not seeing much in the way of results. Plain and simple, content leads to rankings in search engines and rankings are going to lead to your website traffic and revenue! Google, BING, & Yahoo LOVE Content! These are the top three (3) search engines and make up over 98% of searches online. Hence, if you want to attract more visitors to your site, you can leverage these search engines and get mad traffic to your site by writing high-quality content. The most important aspect of any content, whether it is text or video is that it is created with the reader in mind. Real people are reading this content so you want to deliver something that is relevant and interesting. When writing content you want to keep in mind that you are writing it for people, not just for Search Engines. Being original, candid, and building your personal brand is the best way to succeed within any niche, so please make sure you do put some effort into creating your own content. There is nothing wrong with getting some concepts or ideas from elsewhere to incorporate on your page as this will save you time. Refrain from copying and pasting other people’s work as you will lose ANY chance of ranking if you have duplicate content on your site. People are going to be navigating on our website, they are going to be reading our content, and they are going to be buying from us based on our recommendations. They are going to be engaging in discussions, they are going to be sharing our content on social networks, and they are going to be trusting us and our brand. Don’t lose sight of this, I see it all the time where people get so lost in the process of what they are doing that they dehumanize their website to the point where no visitor would get any value. It is all about the EXPERIENCE you create. Find affiliate programs to Promote. Companies like Amazon have grown and exploded their sales online because of their focus on their affiliate program at the core of their marketing. Instead of spending BILLIONS on marketing their products/services (by the way, they have over 488,000,000 trending products on their network), they leverage millions of affiliate marketers through their affiliate program, Amazon Associates. Yes, you will be amazed by the number of trending products on Amazon that you can promote online. Another way to find affiliate programs that are relevant to your niche is, of course, by Google. It is the easiest way to identify relevant affiliate programs, simply insert your keywords into the search engine and you may find products that suit your niche. TIPS: Other than promoting someone else’s product, you can also make some cash by inserting AdSense Advertisements on your website. Many of the AdSense ads appearing beside Google search results, someone’s blog, and even on your own blog are likely to be products with affiliate programs attached. It is sometimes worth checking out the ads (don’t click the ads on your own blogs, you will be penalized) to find out the potential affiliate partners. Very often, you will be surprised to find some great affiliate programs that you might not know. What Is the Outlook of Affiliate Marketing? Affiliate Marketing is Growing at the Fastest Pace ever. It is estimated that the affiliate marketing industry is going to be worth $5.97 billion by 2019. It is growing at an incredible pace and when I look back to when I started out in affiliate marketing. The revenue growth within this industry is growing incredibly fast. All Major Online Brands Are Built on Affiliate Marketing. Amazon, Apple, HP, Best Buy, Etsy… you name it. Without affiliate programs and affiliates, these companies would have WAY less market share online. The likes of Amazon have built their empire off of affiliates, it is rare these days when doing research on a product or service you don’t come across an Amazon affiliate site. There have never been this Many Affiliate Programs. Every year, there are more and more affiliate programs as companies see the opportunity to carve out such a vast marketing team online. There are 20-30 huge affiliate networks alone, with 10,000’s of affiliate programs not to mention all of the 10,000’s of independent affiliate programs. There Are Over 500 MILLION Products You Can Promote as An Affiliate. Yes, you read that correctly. There are over 500 MILLION products that you can promote online! This subset of products only continues to grow, not to mention the 100,000’s of online and offline services that also have affiliate programs. Almost Every Sale Online Has An Affiliate Behind It. That is correct, almost every purchase that you make online has in some form or another an affiliate behind it and earning a commission. Whether you are doing your Christmas shopping on Amazon or you are buying a service to help you build a business (ahem…), there is almost certainly an affiliate reaping the rewards of a commission. It’s brilliant. Affiliate Marketing Will Never Die. There was an underlying fear when I started out online that affiliate marketing was a temporary thing. Logically it didn’t make sense that such an incredible business model would die, but the marketing teams of some of the biggest product launches started piggybacking the idea of this. Affiliate marketing is here to stay. It has grown every single year, creating the greatest opportunity of our lifetime. As offline jobs vanish because people are not shopping as much offline, affiliate marketing grows as a result. If you are looking for ways to sell online, affiliate marketing is definitely the way to go. Where To Start Your Affiliate Marketing? I started my first website at an online training platform. You can build your first websites for free, and even get the first 10 lessons of more than 500 for free too. There’s live chat support, and weekly webinars to keep up on affiliate trends. It’s a great place to meet other online entrepreneurs, exchange ideas, and get help with your business, without being sold expensive mentorships. It is a great training site but it is also so much more. In particular, the site is community focused and it offers a large amount of guidance and support. That makes it perfect for beginners! Read this step by step guide to learn how to sell top trending products even if you are totally new to the online marketing domain. Next story How to Make More Money With Bitcoin Mining from Genesis Mining? Previous story Wealthy Affiliate Unbiased Review: Is Wealthy Affiliate Worth It?